Overseas history: South Africa (Vanderbijlpark): 1988-1989; Argentina (Buenos Aires): 2007 (on and off between March-December 2007, continuously from September-December); Colombia (Bogotá): 2009 – present. Cyberspace coordinates: Career Break Secrets Website/blog, Facebook page and YouTube channel; @CareerBrkSecret (Twitter handle). *It’s filled up again so time to get to the embassy to add pages. Originally, I left to go travel the world when I took a career break from the corporate world in 2007. When I left, I didn’t know that I was going to start as an expat. But, while traveling, I met someone here in Colombia and wound up staying. I have many family members who have a bit of wanderlust in their soul. But, I think I am the only one who is living as an expat. That would probably be my trip to Egypt in 2008. I normally feel at home on the road. I love to travel. But, in Egypt, I just couldn’t seem to make a connection with the people, the culture or the country. I spent about ten days traveling with a friend. The combination of the heat, the constant sales pitches in the streets, and the culture of backsheesh just wore me out. It wasn’t all bad though. I had a few days on a felucca on the Nile and a few days to hang out in Luxor. But, when we returned for our final two days to Cairo, I didn’t go out. I hid in my room — not my travel style at all. I just wanted to rest and wait until it was time to go to the airport and leave. That’s easy. I was an exchange student to South Africa just after high school. I had such an amazing year. Between four host families and a lot of great friends that I made at my host school, I didn’t want to leave. It’s probably why I’ve been back six times since then. On my last trip in 2009, I got to see the country preparing for the World Cup. I was so proud of South Africa. I’ve seen it go from pariah apartheid state to emerging world influencer — with many bumps along the way. It really is a special place. It’s been a few years since I’ve been, so I’m probably due for a visit again. I’m missing a good braai (barbeque) with my friends. My dream is to have a place in or just outside of Cape Town someday, with a view onto the ocean. From Argentina: Breakfast foods — coffee, facturas (sweet Argentinian pastries with various fillings) and medialunas (Argentinian croissants). From South Africa: Some bottles of wine, probably red. No, definitely red. From Colombia: My mochila (over-the-shoulder daybag). These are used by everyone in Colombia, men and women, and they are perfect for carrying your stuff while you’re out running around. Appetizers: A selection of dips and finger foods from Turkey. I love the food there and really miss it. Main course: A pork barbecue prepared by my dad who is a national award-winning BBQer in the US. Maybe we’ll have some fresh Patagonian lamb with it too. The meat will be served with a Greek salad and lots of veggie dishes — the veggies will have been bought fresh from La Vega Central, the produce market in Santiago, Chile. Finally, there will be plenty of my Dad’s award-winning sauce to go with the meal. Drinks: Of course there will be plenty of wine from South Africa and we’ll also have sparkling water for a non-alcoholic option. Dessert: Why select one? It’s a dinner party so there should be a variety! Brigadeiro (chocolate bonbons) from Brazil, ice cream from Argentina (unexpectedly amazing! ), fresh fruit from Ecuador and Colombia, and churros from Spain (that can be a dessert, right?). Nightcap: Amarula (cream liqueur) from South Africa, served with Segafredo coffee from Italy. Put it this way: we like anything that makes people laugh! And this month we are looking at ways of achieving “la dolce vita” — by that we mean, indulging in life with all your senses. Can you describe an instance on your travels when you felt you were living la dolce vita? In 2008, I traveled through Patagonia and had an amazing six weeks. The first part of the trip was on a Chilean ferry called Navimag, which cruises north to south from central Chile to the southern tip. You are in protected waters (most of the time) and on both sides of the ship is this beautiful, untouched landscape full of snow-capped volcanoes, lush green countrysides, enormous glaciers (some of the biggest in the world), and tiny, remote villages. You can also see marooned ships and the occasional dolphin. The weather can change from clear, sunny skies to blustery snow in a heartbeat. That trip is one of my most special trips ever. I really felt like I was living La Dolce Vita during those four days. I personally think that the yearning for la dolce vita increases as one grows older. I know you are an expert on adult gap years. What made you decide to take one for yourself? My catalytic moment was the night I went out with some friends to dinner on the River Walk in San Antonio, Texas, on a hot, balmy Friday night. They could tell I was down, and had been for some time. They asked me what it was going to take to make me happy. I didn’t have a good response that night. But, the question haunted me all weekend. I finally had an epiphany that I really wanted to leave my corporate job and get out in the world and travel. I traveled for almost two years mostly through South America, parts of Europe, Turkey and Egypt. And then you decided to set up a business to encourage others to do the same? Once I decided to settle in Colombia, I chose the entrepreneurial path and set up CareerBreakSecrets.com. I wanted to help popularize the idea of taking a career break and show other people that they can do it with just a little bit of guidance and inspiration. We’re now in our third year and will be releasing a book and launching our show, The Career Break Travel Show, globally later this year. I love hearing from real people who have decided to take their own break and if they set up a blog, follow them around the world on their travels. The people I’ve encountered have ranged from teachers to social workers to business people who have done some amazing things like volunteer and share their skills, hike Patagonia, bike across New Zealand, or take transcontinental train rides. 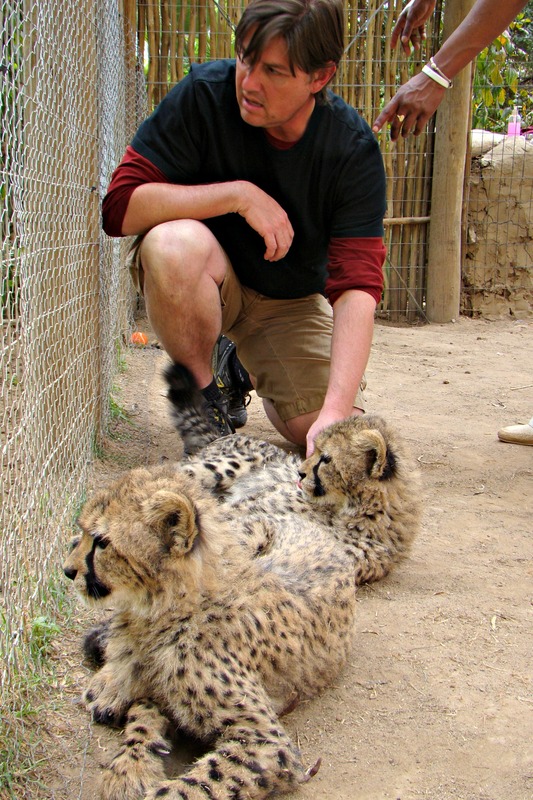 img: Jeff Jung with baby cheetahs near Oudtshoorn, South Africa, September 2009. Oh yay, definitely. Between the serial wandering and founding such a cool organization as CareerBreakSecrets.com this guy is IN! Thank you so much for having me. It was a really fun interview. All the best to everyone who is part of the Displaced Nation! Hell yeah it’s a ‘Yay!’ LOVE the photo by the way. I think it’s great to try to convince other people to travel – it’s what I spend half my life doing! It makes for more confident, more worldly, more well-rounded people, and that can only ever be a good thing. I consider it a noble cause to persuade others to get ‘out there’. So, good job. And great that you can make a business of it! I’ll echo TJS’s “hell yay” — as I’m pretty sure that no other Random Nomad has immediately inspired another blog post, and it’s only fair you join us for the celebration of this extraordinary feat! For those who aren’t aware: Linda Janssen of “Adventures in Expatland,” who offered the first “yay” above, has paid further tribute to Jeff and his work to make the mid-life gap year more mainstream in “Career Break? Yes Please!” Thanks so much for doing that, Linda! What’s more, Jeff, I’d love to celebrate with the menu you’ve proposed — every single dish of which appeals to me, including the spot of Amarula at the end (yum, what a dreamy liqueur!). I really appreciate the way you’ve picked out the “best of the best” foods wherever you’ve gone in the world. And I share your attitude towards desserts: “Why select one?” Why indeed?! My only question is, is it only the braai you miss from South Africa? We had a guest post by a South African expat in London last week, and she had a list of 10 items she is constantly craving, none of which any of us had heard of (though braai was a feature). Rusks. I miss rusks terribly. Every time I go back, one of my host families has a fresh batch of homemade rusks waiting for me. It’s definitely not only the braai that I miss. But, it is such a fundamental part of the culture. It’s an event which can last hours. Ahhh, good memories. We can definitely plan a get together to break bread!